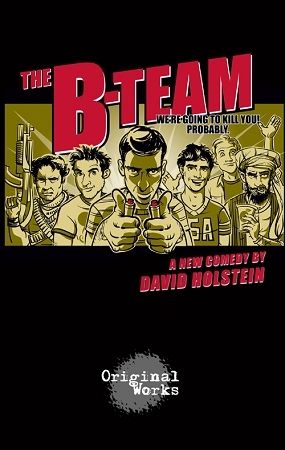 Synopsis: THE B-TEAM is a dark comedy that follows a crew of second-string terrorists from Buffalo, New York -- a leader with thumbs paralyzed in the up position, a militant homophobe, a bombmaker seduced by capitalism and a Jew who really hates his mother -- on their quests for love, approval, McNuggets and martyrdom. "Torches the place with a Molotov cocktail of raunchy situations, filthy language and unforgivable stereotypes. And that’s a compliment." "As if Tony Kushner wrote a Saturday Night Live sketch." "The only way to handle material like this is to swing for the fences, and that Mr. Holstein does. A perfect entertainment for the somewhat desperate times we seem to be living in."